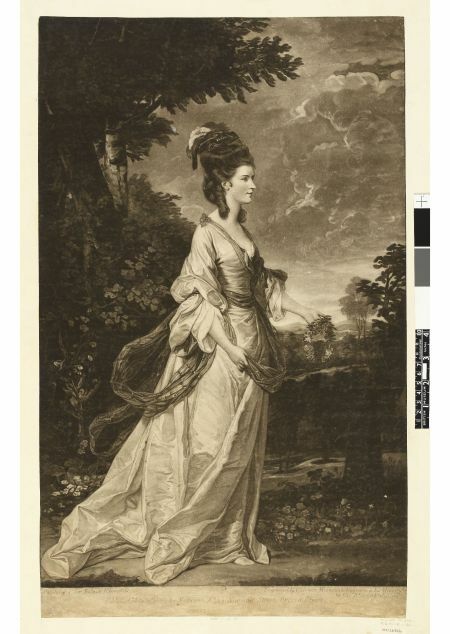 Valentine Green's engraving after Reynolds shows the portrait of Jane Fleming, Countess of Harrington (1755-1824). This image offers an inescapably fashion-conscious depiction of ayoung woman, elegantly displayed whole-lengthin an exterior elegiac setting – the beauty of which works to define and enhance the sitter's own. The portrait, first exhibited at the Royal Academy in 1775, was commissioned by Fleming's mother, and is characteristic of Reynolds's later works which focused upon the female subject's fashionable credentials. After her 1779 marriage to Charles Stanhope, Viscount Petersham, later 3rd Earl of Harrington, Fleming became an extremely wealthy woman, whose position within elite society was aided not only by the popularity of the union, but also by her beauty and fashionable dress. Here she is shown walking through an idealised landscape, emphasisingboth her aristocratic status and her remarkably easy infiltration within the natural environment. Fleming's stylish and contemporary appearance is juxtaposed with the pastoral nature of the setting – and her pale, luminous silhouette glowing against the dark backdrop works to heighten the beauty of her form. The tight and confining bodice and mantle contrasts with the flowing drapery of her loosely-bunched sleeves and silk skirts – a contemporary fashion which led one 1745 male commentator to remark on the 'monstrous disproportion between the upper and lower part of a woman', although he still conceded that 'to the Eye it is very agreeable'. Indeed, Fleming's position in profile allows the various elements of the garment to be admired. The lady's stance suggests that she is walking, unaware of our gaze, the silken fabric of her dress and her gauzy shawl billowing gently in the breeze. Her natural realism evokes a powerful relationship with the landscape. Her hair, carefully coiffed, and intricately decorated with pearls, plumes and ribbons, is the only realistic association with contemporary and urban society. However, even the use of ornate ostrich feathers, a short-lived style made popular by the Duchess of Devonshire (see previous entry), cannot undermine the natural appearance of the sitter; even curling strands of hair in the elaborate style start to become gradually undone by the elements.Reynolds often harnessed this emphasis on the natural to a classical narrative in his female portraits. In this respect,Fleming might be likened to Flora, theRoman goddess of Spring, or to Aurora, goddess of the Dawn.